Call of Duty: Advanced Warfare is the new game of the CoD series and it’s coming out on 4th November. The series is taking a different path this time by embracing a new theme and leaving behind the realistic approach. Advanced Warfare will display a futuristic world, where current-gen technology is fused with science fiction theories. The idea by itself seems quite innovative but the truth is that most of the upcoming features come from other first-person shooter titles. They’re indeed new to the series but old to the genre. 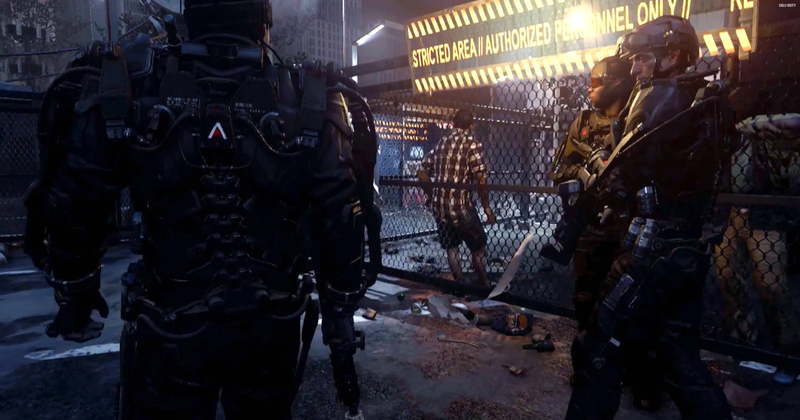 Discover the core new features coming to Call of Duty Advanced Warfare this autumn. Call of Duty has always been about representing modern war in the most realistic way, so humanly impossible moves, such as long-range jumps, were never considered in the previous releases. However, things will be different now with the upcoming high-tech theme. Advanced Warfare soldiers will be equipped with a jet pack that will allow them to execute several futuristic maneuvers. Wall climbing, high jumps and long-distance leaps will be part of the new game maneuvers. Advanced Warfare will present a series of new weaponry non-existent in the real world. As expected, bullet-based guns will still be part of every battlefield but that’s far from being a limitation since countless sci-fi weapons are being developed right now. Still, the most exciting innovation will rely on the vehicle sector, where laser tanks, hover bikes and ultra-sonic combat planes will become a reality. It’s not entirely clear how the next Call of Duty game will make use of environmental interactivity and dynamism. The only functionality known so far is a semi-automatic metal barrier that can be assembled in a question of seconds. This barrier prototype will most likely be displayed as a dynamic element in multiple environments, allowing players to take advantage of this futuristic cover. For the first time, Call of Duty will have technologic advanced skills all over the place. Players will be equipped with a nano technology device capable of providing special powers, from super strength and agility to hyper infrared vision. Additionally, there will be other utility skills that will truly revolution the series – invisibility cloaks and anti-explosive scans will be two of the upcoming defensive features. Advanced Warfare will feature a drone and robot systems. It’s rumored that drones will have a significant role in reconing but it remains unknown if they’ll be an integrant part of multiplayer. Furthermore, the advanced robotics will allow players to command and fight from the inside of massive combat robots. It’s unclear if machines will have any special abilities. It’s a whole new experience for Call of Duty. So far, the reception hasn’t been the best, specially because most of the upcoming features come from other FPS games, such as Crysis and Titanfall. Let’s hope Sledgehammer Games is preparing further and more complex content and that originality will find its way into Advanced Warfare.